I already mentioned cooking falafel in the leftover fat from Chinese Sausages http://www.theultralighthiker.com/hiking-food-protein/ (the first for dinner, the second for breakfast), but you can carry a pack of falafel mix and approx 60 ml of eg olive oil in a small plastic bottle. 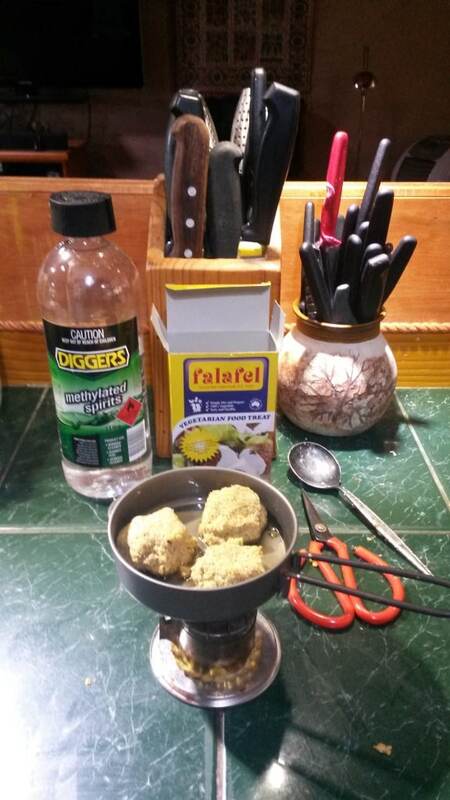 A fry up will make about a dozen falafels from a 200 mg packet. . You could form the balls and place them on a tissue so that you would have your billy free to put them in as they came off the pan – or you could just place them in your mouth. You can manage to cook them with only your hiking spoon. You have to add 200ml of water to the dry mix at the start and leave it to stand for ten minutes. I have found you can just eat the prepared mix cold and uncooked too, but it is better cooked. The 200 grams of falafel mix is 1580 kj and the 60 ml of oil about 300 kj, making1880 kj or over 450 calories – quite an acceptable meal for a carry weight of 260 grams – and for an interesting change.